The basic idea here is to do a series of very short efforts with very little rest between them, for a pretty long period of time. …and so on and so on for the duration of the interval. How long are you going to do this for? – Three -four sets, 5 minutes between sets. Ideally, you aspire to pile enough ten-minute segments on top of one another to equal the duration of your races. How hard do you go during the “on” segments? You’re familiar with the level of effort you put out in your 2×20’s by now, right? You need to go harder than that. More than a little bit harder. Ideally, you’ll hit these on periods at right about 150% of your FTP, if that’s a number that means anything to you. If it doesn’t, it’s harder than what you’re dong your 2×20 effort at. A lot harder. For most folks it’s going to be about 50% harder. How easy do you go during the “off” segments? – A lot easier, but you aren’t soft pedaling. 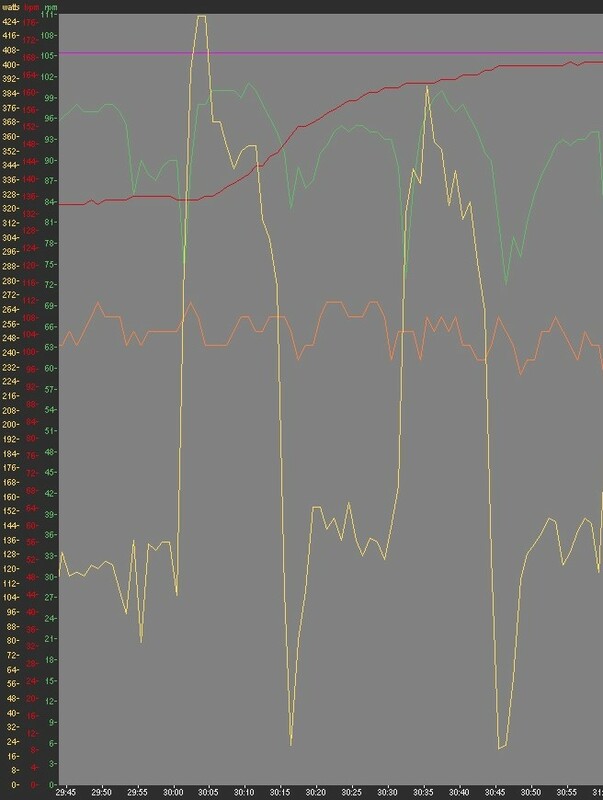 Right about 50% of your FTP, or in the neighborhood of half as hard as your 2×20 level. This is going to seem way too easy when you’re starting out, but by the end – if you’re doing these right – it’s probably going to be really damn hard to keep the “off” that high. Ultimately, you want to be able to do however many of these it takes to equal the duration of your typical CX race. That’s the basics of this workout, but let’s talk about how folks tend to screw this up, shall we? First of all, you really can’t do this workout correctly with a power meter that’s set to anything other than instantaneous power display. Even a 3-second display rate can screw things up; that’s 20% of the interval duration! So, go check your PM settings and adjust accordingly. Next big screw up? These aren’t sprints. You’re looking to nail these output levels for the duration of the intervals, not way overshoot them and then coast back down to them. If you’re doing a 300 watt “on” segment, that means 300 watts for 15 seconds, not 400 watts for 5 seconds and then 250 watts for 10 seconds. That’s fine and all, but it’a different exercise. A corollary to this is, on the “off” segment, you aren’t coasting. Ever. You’re doing 50% of your ftp. It’s not uncommon at all for people to experience the “off” portion as just as hard – or harder! – as the “on” section as the overall duration of the interval set reaches the duration of your race day. ~ by crosssports on September 26, 2017.